Happy first Monday of 2016! I don’t know about you but this weekend was crazy busy for us – Christmas decorations to take down, returns to do, cleaning, and grocery shopping/meal prepping to start my Advocare 24-day challenge today! If you’re interested in learning more about this challenging, or joining me for it, let me know! Or if you’ve done it before and have some tips + tricks, holla at me. For so many reasons, I’m just feeling super excited about this week and this new year. Now, onto this look that I’m sharing with you today. One thing that I did this weekend was shop for a new pair of skinny jeans. I’m obsessed with my Madewell skinny jeans, but a girl does need some variety (like I was wearing those 4 times a week). I tried on basically every brand that I know people love: Rag & bone, Paige, Citizens, Hudson, and last but not least: AG. When I put on this pair of AG skinny jeans it really was like I found my soulmate! They are stretchy yet form fitting – so they allow for alot of movement and are super comfortable. They’re flattering and the perfect length for booties or heels. They’re distressed but not too distressed. And the quality feels amazing. I’m so excited about them! 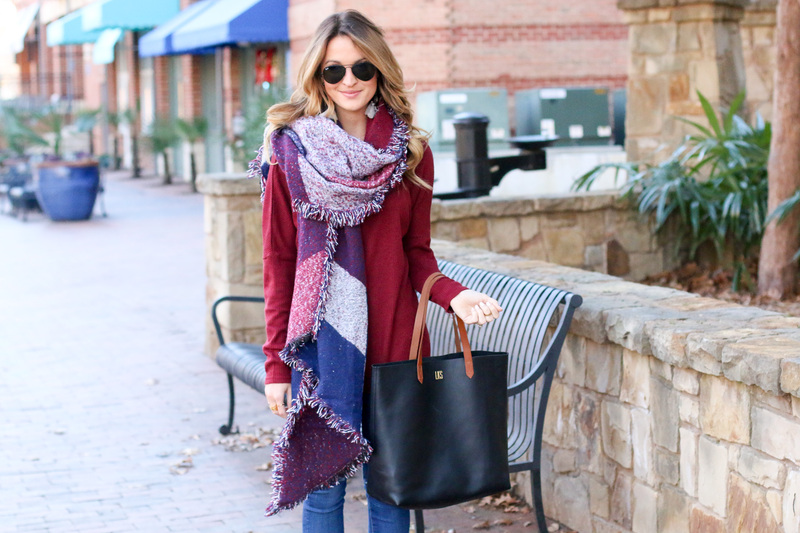 Onto this oversized sweater + colorblock scarf. I love the look of an oversized sweater with distressed skinny jeans. I just feel like it’s such an easy, cool look that can really take you anywhere. Also, I cannot put into words how soft this colorblock frayed scarf is. Seriously the softest scarf I’ve ever put on! 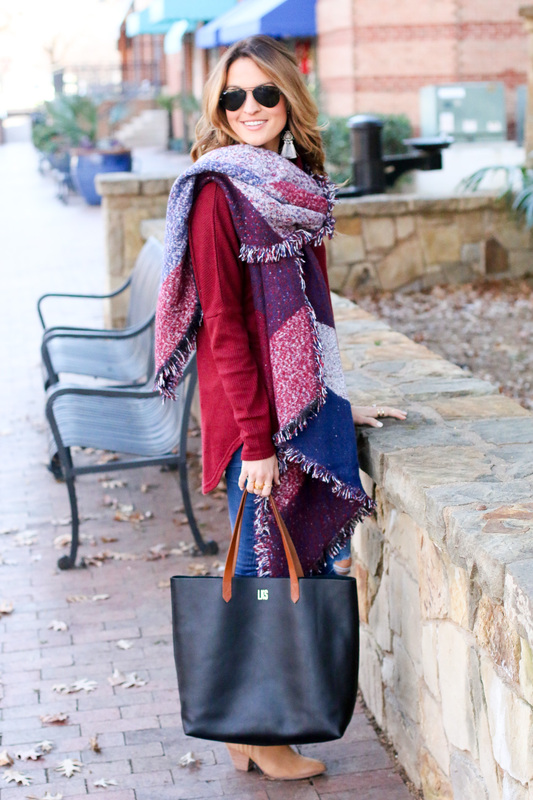 I also like that it’s not a blanket scarf, so you don’t have to fold it perfectly to get it to hang just right. It’s easy to throw on and wear 2 or 3 different ways! 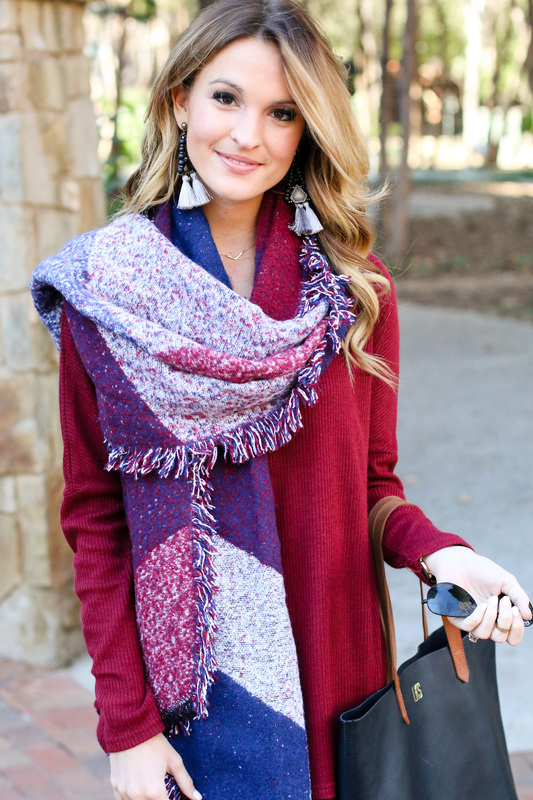 This scarf looks insanely cozy! I love the way you paired it with those fun earrings!